We have all had those mornings where we wake up and think, " WOaaaa my eyes are SO puffy!" Bummer. Never a great way to start your morning. Dehydration. Maybe you had a little too much fun the night before. Time to hydrate with water...lots of it. Too much salt and/or processed food in your diet. A more serious medical condition. If you have constant puffy eyes it may be the underlying root of something else. Making an appointment with your Dr. is always a good idea just to be on the safe side. This week I am going to share an easy and effective way to help de-puff your peepers in no time flat. Place two metal spoons in the freezer or in a cup of ice. 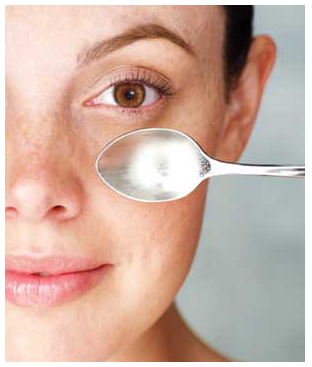 Place the backside of the spoons over your eyelids for about 6-8 minutes. Viola! If this is your first time here, I included a few links to past skin care tips you may want to check out. On a side note: If you are a blogger and are in need of a cute new header, check out this awesome giveaway going on LaDitta Design! Thanks for sharing - I would have never thought of that. No way! I have got to do it. Yes, I do have puffy eyes some mornings--a very needy infant will do that to you. :) Thanks for the awesome tip! I love this trick. This tip requires the perfect amount of time to sip a cup of tea and enjoy ~ 2 songs for those days when I can convince myself to get out of bed ten minutes early. Starting the day in a mellow way instead of rushing around would be such a nice routine to fall into! Ugh, I wake up every morning with thee worst puffy eyes ever. It must be heredity or somehting bc I don't eat alot of salt. I've never tried the spoon trick but usually lay a cold washcloth on them for a few minutes. It actually feels really good. Thank you so much for visiting my blog and commenting. I am so excited to read more of yours! Good God I can't tell you how badly I need this tip. Having a baby is exhausting! Wow that's really good to know. And everyone has spoons so this is so awesome! Cool! I will stick a couple in my freezer! This is great! I love this tip! I will put some spoons in the freezer now. Another reason for a puffy eye problem.... A newbie who thinks that 5am is the appropriate time to wake up and demand foooood! Btw, Abigail wanted me to tell you to tell Max that she misses him! :) Haha! Love you friend! What a great tip & so easy!!! love this! it definitely works! Bummer! I've tried this method before and has yet to work on me. Maybe I should just sleep more. That is awesome!! I'm definitely going to try this soon! I look like a nightmare in the morning! Wow, it's so simple, can't wait to try it! I love all of these skin care posts by the way! Great tip! I know I could use this from time to time...definitely!! I love that spoon tip. I do something similar that helps get rid of puffy lids. I dip my lash curler in icy cold water, pat dry and curl my lash. It feels soooo good getting my lashes curled while the metal parts reduce the puffiness of my eyes. That's crazy! So going to try that. Oh my gosh! I love this post!! And I had no idea about the baking soda!! Thanks for the great tips! Thanks- checked out your contest. Is there a giveaway to enter for one- or just the discount code? I love the frozen spoon trick! Works great! Thanks for stopping by my blog earlier! Wow, thank you for sharing this little tip! haha...this is so good! And cost nothing. I definitely need this. Um, going to put spoons in my freezer now! I love all your little tips! I definitely will try this!! You may want to make an appointment with your Dr. just to see if its something deeper. huh. never thought about food allergies before! and i don't have any that i'm aware of…or any allergies at all…which seems weird. i should definitely ask the dr. about that. thanks so much!